Eusebius o Caesarea (Greek: Εὐσέβιος, Eusébios; AD 260/265 – 339/340), an aa kent as Eusebius Pamphili, wis a Greek historian o Christianity, exegete, an Christian polemicist. He acame the bishop o Caesarea Maritima aboot 314 AD. 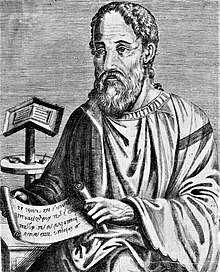 Thegither wi Pamphilus, he wis a scholar o the Biblical canon an is regairdit as an extremely well learned Christian o his time. He wrote Demonstrations o the Gospel, Preparations for the Gospel, an On Discrepancies atween the Gospels, studies o the Biblical text. As "Faither o Kirk History" he produced the Ecclesiastical History, On the Life o Pamphilus, the Chronicle an On the Martyrs. This page wis last eeditit on 8 Apryle 2017, at 02:33.